This policy provides that parents/guardians of a student who is under twenty-one (21) years of age will be notified when the student is found responsible of or admits to an alcohol or drug infraction. Amendments to the Family Education Rights and Privacy Act (“FERPA” or “Buckley Amendment”) allows parents of any student to be notified of that student’s violation of any federal, state or local law, or any rule or policy of the University, relating to the use or possession of alcohol or controlled substances if: (1) the University has determined that the student has committed a disciplinary violation with respect to that use or possession; and (2) the student is under the age of twenty-one (21) at the time of the disclosure to the parent. For all matriculating students, this policy became effective August 22, 2001. This policy is adopted so that parents/guardians of a student who is under the age of twenty-one (21) (at the time of the disclosure to parents/guardians) are informed when their student is cited for alcohol or controlled substance violations while attending the University. It is intended as an educational strategy, to enable parents/guardians to partner with appropriate University representatives to reduce the risk of students developing patterns of behavior that could jeopardize their academic success or health and well-being. It also is intended to empower parents/guardians to help us reduce drug and alcohol abuse on campus. Under special circumstances, professional staff may elect not to notify if they determine that to be in the best interest of the student. Parents/guardians of students will be notified in writing when a student admits to or is found responsible for an alcohol or drug infraction. This does not include students who are sanctioned solely for being “knowingly present” during drug and/or alcohol violations. Parents will receive a letter explaining who to contact for additional information. Before calling, it is suggested that parents/guardians contact their student to determine if the parents’/guardians’ assistance is required. We hope that parents/guardians play a proactive role in this process by using their influence to keep students from returning to the judicial process. Upon receiving written permission from the student, (which can be in the form of an email) parent(s)/guardian(s) may contact staff members from Residence Life and the Office of Student Conduct to gain any necessary clarification. The system of due process for all students does not allow the University to forego duly authorized sanctions for some students and not for others. Students who commit violations will be held accountable for their offense(s). They will have access to counseling and other academic support services to maintain their educational goals. The vast majority of students readily embrace these opportunities. Recent evaluations indicate that only about 4 percent of students who receive alcohol counseling through the University’s referral system return to the judicial process for a repeat offense. More information about FERPA can be found at www.ed.gov/. 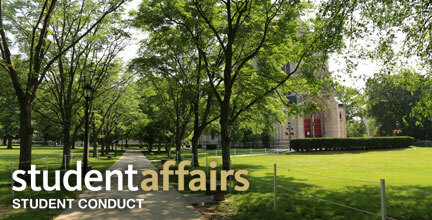 In order to obtain a FERPA waiver, thereby giving access to parents, please visit www.registrar.pitt.edu/ferpa.html. Clearance Forms are typically required if students plan to Study Abroad or find employment on campus. Forms should be completed and turned in to Student Conduct in 738 William Pitt Union to be processed.